Coimbatore is one of the fastest growing industrial and educational cities in Tamil Nadu. It is known as the 'Manchester of South India due to vast textile and commerce. The city corporation is being upgraded to the digital forms. Most of the transactions are computerized and made online in the city including EB, Mobile and even bank transactions are made easier online. People can now pay the Municipal corporation property tax online by simple steps. We have given step-by-step procedure to pay property tax online in respective website. Watch Video for your better understanding. Step 1: Keep your Property Assessment Number ready. 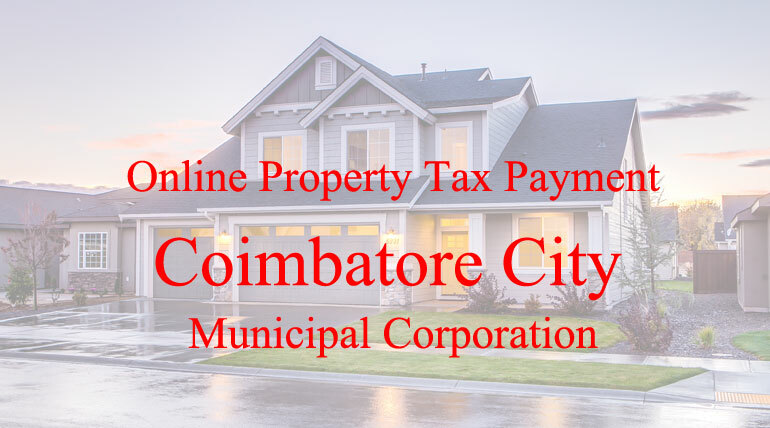 Step 2: Click 'PAY YOUR TAX ONLINE' to enter Coimbatore City Municipal Corporation website. Step 3: You can see Service, New Assessment No. and Payment Type in the page. Step 4: Choose 'Property Tax' from Service box. Step 5: Enter your property Assessment Number in 'New Assessment no.' box. Step 6: Select 'Payment Type' and click the 'View' button. Step 7: You will get Assesee Name, Address and other details of your property. Check the details. Step 8: If your details are correct, click the check box that is pointed out in Red arrow. You can view the payment amount. Step 9: Check the amount displayed and click 'Submit' button. Step 12: Enter the correct details of your bank like card no, expiry date, CVV no and others. Step 13: You will get the receipt of your payment once the payment is successful. You can take print if needed. Note: If you are paying in credit card, check your property assessment number keenly before making the payment. We have given image below pointing out the Assessment number.